Att utforska Bratislava självständigt kan visa dig sevärdheterna, men kommer inte att ge en insidan ta staden. Den här vandringsturen levererar: låter dig uppleva sitt förflutna, kultur och mat genom lokala ögon. Hitta Gamla stans hemliga platser, upptäck publikens fria pubar och synpunkter, kör en trolleybuss, njut av en Bratislavan-picknick och mer: Allt som din guide delar berättelser som du annars skulle missa. Inträdesavgifter och valda mat och dryck ingår. This was a great tour and our guide, Patrick, was excellent. We were the only ones on the tour, which was actually a bit of a disappointment, it is nice to get a break once in a while and just listen, but as we were basically being given a private tour, it turned out to be exhausting and a bit too much in the end over 6 hours. Great value for the money, and we definitely felt like we experienced all that Bratislava has to offer. This was by far the most amazing walking tour I have ever had. Klaudia, our guide is an amazing person - we had lot of fun, she was full of local knowledge and the places we visited were really cool - all of them. We have seen many different sights of Bratislava, but personally I loved the most last place we visited - it was charming and loveable superlocal beer garden. Overall it was a great experience, and I would highly recommend taking this tour while in the city. This was the best walking tour I've ever been to! Although it was raining we had the best time thanks to our guide Klaudia who provided us with a lot of history and insighs from the local life. We tried a craft beer in punk brewery,local pastry and also she prepared us amazing picnic at the caste with cheese and prosciutto. 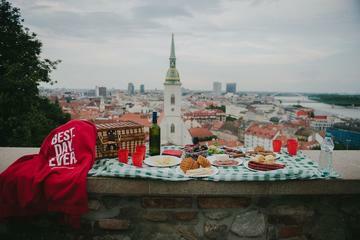 If you visit this capital you should definitely look for Bratislava urban adventures because the service they provide is beyond the expectation! Thank you guys! Great tour! We were only a group of 5 max is 12, so it was like a personal tour. Our guide, Klaudia, was superb - knowledgeable, fun yet professional, and engaging. I don't normally drink beer, but I easily managed the 2 glasses we had - first in a wacky micro-brewery in town, and then at the last stop of the tour, a local pub in the countryside / park. The mini-picnic of Slovak delicacies and a drink! on the lawn outside the castle with views over the city and river was a highlight for me. Came away feeling from the tour with an understanding of the city, its history and lay-out, and having had a most enjoyable 4 to 5 hours. Totally recommend it to anyone. FYI - you do walk around quite a bit and climb some steps up to the castle, so wear comfortable shoes, but it is all in a very relaxed fashion, so not exhausting. Во время коммандировки в Братиславе у меня было немного свободного времени и я решила забронировать данный тур. Клаудия, наш гид, весело и интересно рассказала и показала нам историю города, его прошлое и настоящее. Мы посетили такие места, которые я не смог бы найти сам. Thank you so much for this tour. It was really great day. Claudia is very friendly, kind and knowledgeable as well. I learned a lot of information about the city. I tasted a local drinks and I saw the best of Bratislava. I recommend this tour. Έχοντας λίγο χρόνο στο επαγγελματικό μου ταξίδι στη Μπρατισλάβα, αποφάσισα να συμμετάσχω σε αυτή την περιοδεία. Ήταν πολύ καλή απόφαση! Ο οδηγός μας Klaudia ήταν απλά φανταστικός, γνώστης και τόσο διασκεδαστικός. Έχουμε δει μέρη που ποτέ δεν θα βρούμε τον εαυτό μας, μακριά από τις συνήθεις τουριστικές διαδρομές. Μπορώ να συστήσω αυτή την περιοδεία. This tour is amazing and fun! Gives you a real insight and a feel for the lovely and interesting city. Klaudia is a gem among tourguides I dare to say. We had the best time with her, enjoyed the picnic, craft beer and amazing views of the city. Our guide was generous with her time and we spent an hour more exploring this picturesque city. Booked this tour with a friend and we have had best day together with Klaudia, she is fun, knowledgeable and very bight person. This tour took us way beyond the old town. Picnic, beer and the bonus saint Mary cave was just a blast. The tour was amazing! Such great food and drinks and our tour guide Klaudia was really friendly and knowledgeable. Highly recommend this tour!